I was inspired throughout this semester by factors that included motivation to change our ecosystem by using recycled and biodegradable materials over materials that aren't. In this piece, I used clay which is a form of soil, meaning that it is technically biodegradable. 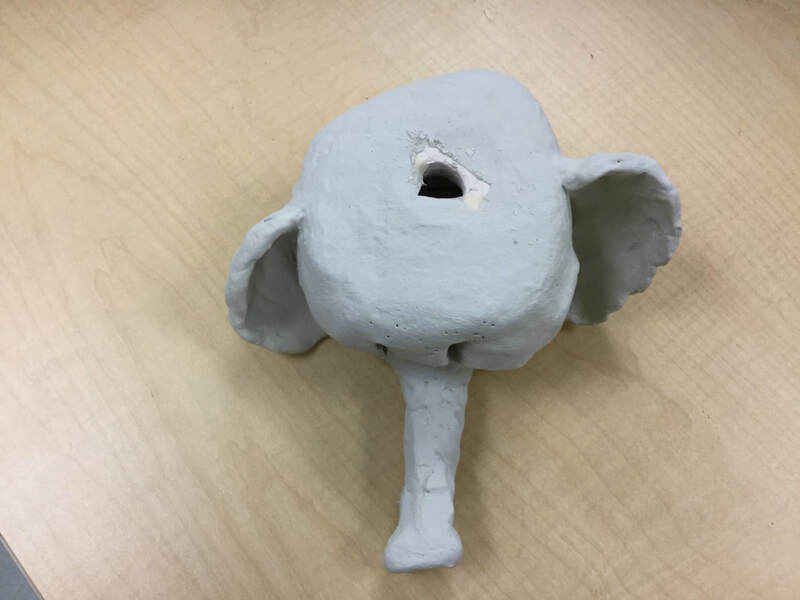 I was inspired to create this because we were told we were going to be able to leave an artistic impression here at Vernon Malone because these pieces would become a part of the campus in our school garden. I chose an elephant for this piece because I wanted to convey a animal that had strong influences in teamwork, which is why I chose the words "Stronger, Together, Onward" for the stamps on the back of the piece; all terms that have to deal with teamwork. I wanted it to show that here at Vernon Malone, we work in teams often to accomplish a greater goal. WE MUST put OUR GROUP aspirations before our personal aspirations - "...because when we work together, we are greater". I hope this piece does in fact convey more than just something to look at. I want it to be an inspiration for people who want to do "more good" here at Vernon Malone. However, if I were to do this project again, I would ensure that I "slip and stick" on the trunk so it wouldn't have fallen off during the hardening in the kiln. I do believe that this is my most successful project this semester, not because of looks, but because it shows more than just what you can see. It goes to show an underlying message. If I had to change one of my prints, this would be the one that I would change because I believe I used too much ink which took away from the overall design. I would try to continue rolling the ink to ensure that it wasn't think or anything of that nature. 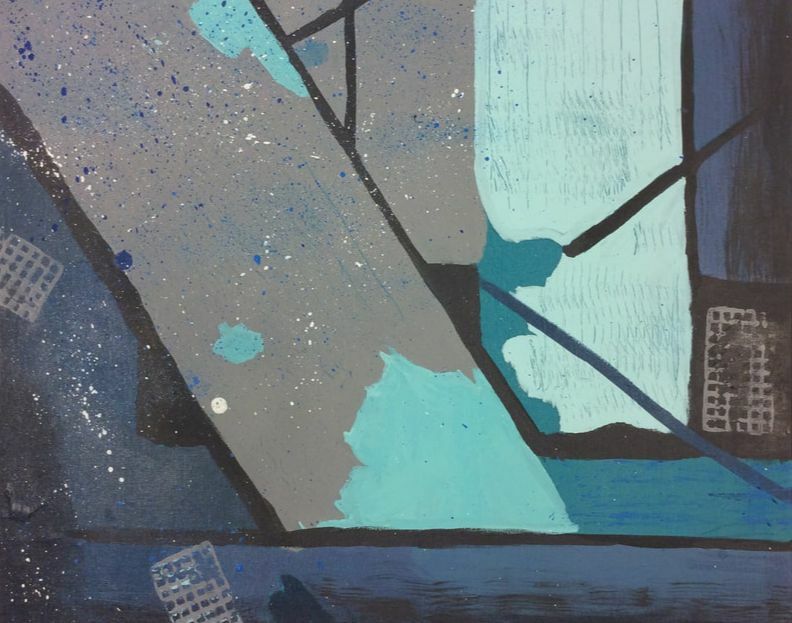 The brayer could have made the ink less thick which would have given my piece an opportunity to show all of the textures that I included in the print itself. We started by cutting out a cardboard block which served as the base for the actual print. From there, we began to cut out shapes to glue to our print. After we glued the shapes to our block, we decided to experiment with the hot glue gun by drawing designs onto the shapes which showed some of the textures below. In the final print, I would make sure that more ink would fill the negative spaces so that the work looked more interesting. I believe that this print was my best out of all of the ones I did, specifically because I used a variation of uncommon colors which turned out to look very good at the end of the printing process. 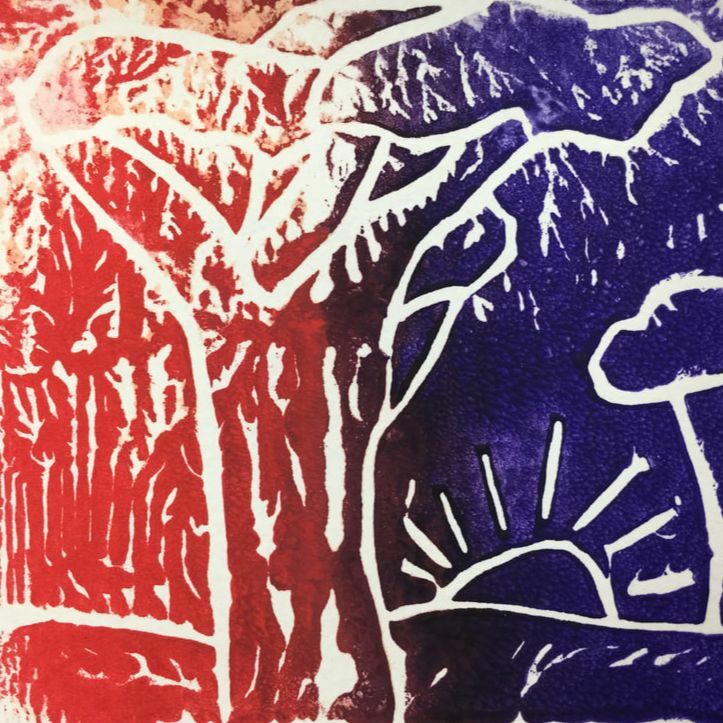 The process of making this print was relatively easy because it was using a print block and a gouge. The gouge slid through the print block material very easy which offered for a tremendous looking design. 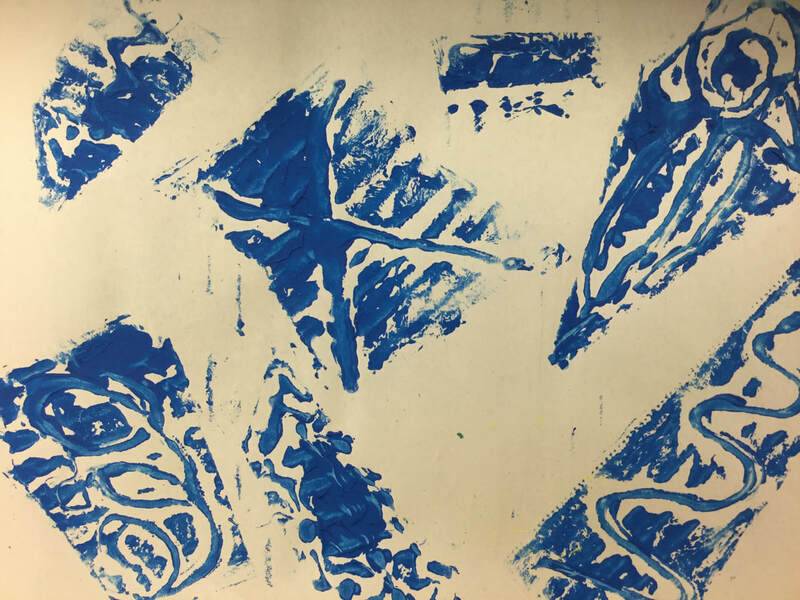 By far, the styrofoam print was the one that I enjoyed the most simply because it was one of the easiest that I was able to encounter during the printmaking process. The smooth and malleable material served as a great creating experience because it was easy to draw our designs into the styrofoam blocks. One of my favorite parts was using the baren to make sure all of the ink had transferred to the paper. It was simply satisfying. 3-D Art Forms - "Leaning Freedom"
I wanted to create something that was simple yet someone would know that it was intentional by looking at it. I started by going out in the freezing cold and I immediately saw a bush. This bush was beautiful with large leaves, so I plucked a few. I then went down by a stream in my back yard and picked up a rock that was sitting next to the water. I brought it back up to the leaves and I tried to make the leaves look as symmetrical as possible. From that point, it got so cold that I just plopped the rock right on top. It looked quite interesting to me because if someone saw it I think they wouldn't think twice that it was intentional. If I were to do this project again, I'd try to take more time on making my project. It would have looked ten times better than it did had I been able to persist through the cold weather. 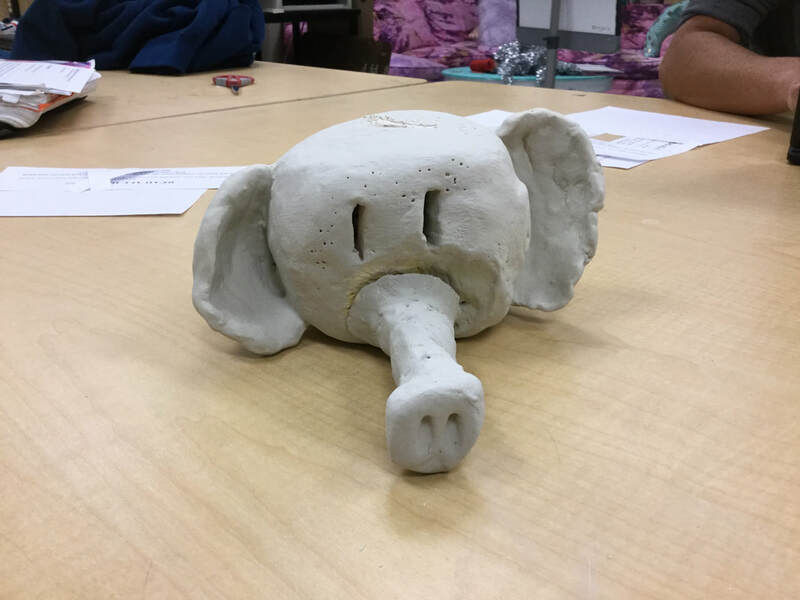 Creating this piece helped me explore the use of styrofoam in artwork. Not only that, I developed an understanding about the reasoning behind why art is important. For starters, I began by creating a plan on a lighthouse. This plan consisted of two swirls that rose up to the top of the two cups. The two spirals became one when I executed the original plan, simply to make the sculpture more sturdy. Then, I began to cut around. While trying to harden the glue quicker, I noticed we were able to melt the cups with the hairdryer. I thought it was a neat idea, and it created organic shapes, so I wanted to incorporate that into my piece. 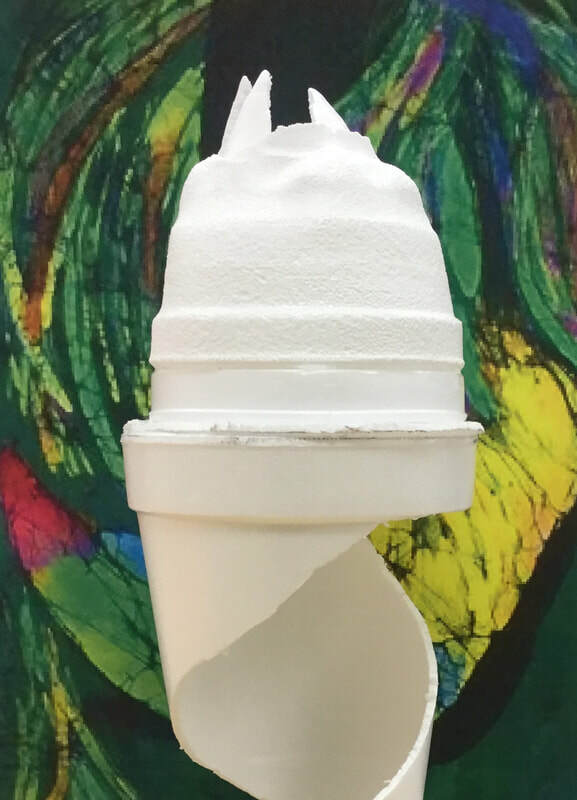 I melted a scrap cup and it slowly turned into a dome-type shape. This became a great topper for the entire piece, so I plopped it on the top. While doing this project, I realized something about the importance of art. According to one of the slides that showed us how to do the project, it stated that it takes nearly five-hundred years for styrofoam to decompose. So, instead of trashing the earth with unused styrofoam, we can create art that can be observed by many rather than to have it ignored somewhere in the ocean polluting our ecosystem. This art was consequential in my exploration of art because I now have a profound reason to continue creating bio-friendly art. It's like art for a special cause! Collaboration Abstract Painting - "No Idea"
Our ideas for this work of art were original. I say this because it was completely abstract and the only plan we followed was from works we had previously created. This work was definitely creative because we used new mediums that we hadn't used before and we managed to use different techniques on this work. We basically just went with the flow. My source for inspiration was the fact that we were able to use a different type of paint with little experience using that medium. These ideas happened by accident for the most part because we didn't intend on having a plan for this work of art and it all ended up falling into place. I learned a new process while developing this work, as we used a different type of paint therefore we gained experience in using it. I do not believe I gained any experience with familiar materials. When we made mistakes, we just painted right over them. In some cases, we were able to use that to our advantage since this was an abstract painting. Landscape Painting - "Sunday Sunset"
These images are pretty basic to be quite honest. Each one of them has a twist on it using different techniques for photography. On the portrait image, I used the rule of thirds technique. For the other images I did not use any non-ordinary technique. These images were inspired by the great people around me. I did not try to show any emotions in my photography. My goals were to learn new techniques for taking photographs. These will influence my pieces of photography in the future because I know know what to look for. Artists Develop Skills - Pastels - "Sun-setter"
This piece of art is abstract yet it followed (and strayed off of) a beaten path. The colors blend well together despite being complementary in a few areas. The blue in the mountainous sky really brings them out as if they weren't just boring blobs of gray. The art piece was created with pastels to blend the colors together. Though it was very messy. The big idea was to simply experiment yet again with the pastels to ensure that in future projects, I know what is acceptable to use in any scenario. My overall thought for this image is that it works very well together and overall it's a win, win. 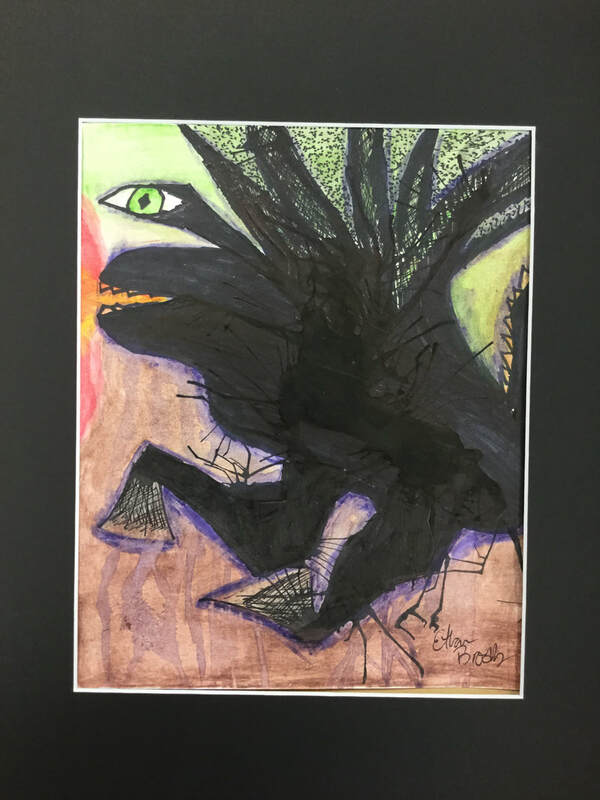 Artists Create Original Art - "The Winged Frog"
This artwork was basically freelanced because we unknowingly started off by blowing ink around the paper to create an abstract design in which we would draw a monster or some other type of object or being. It kind of looks like a one eyed monster frog and the thing that brings it out the most is it’s eye. For this piece, we used watercolor pencils, ink, graphite, and paint brushes. This was not inspired by anyone, although, we were given examples of similar projects; there are also no emotions portrayed in this artwork. My goal for this piece of art was to learn how to create art without having a plan and I did reach my goal because we started with ink splats. I learned how to freelance art while creating this piece. It will help me in future works because now I have developed a skill in freelancing art. I find inspiration for most of my pieces from motivation to (slightly) change the world. My favorite pieces to create have the medium of recycled material. I often times prefer abstract art over any other form.